Peri peri chicken is so easy to make and you can control the spice. Peri peri chicken is so easy to make and you can control the spicy heat to your family's preferences. This page was last updated by Bernard Preston on 11th January, 2019. First you need to barbecue the chicken pieces and then set them either in a potje or in the oven in a marinade to cook. The wisdom of many chefs appears that it's best to seal the meat by first going onto a hot grill, and only then adding it to the marinade and a slow cook; others will disagree so you just follow your dictates and preferences. Start by purchasing two whole organic birds; they cost a bit more, but they have less water and certainly will taste better. You can also keep the chicken bones for a bouillon that will strengthen the cartilage in your joints. Dismember them into the size pieces that will suit your family. Generally, though not always, whole birds are cheaper than chicken pieces; it's Bernard Preston's recommendation that you avoid the more expensive fillet cuts; the cartilage in those bones provides important nutrients for your joints. I always do two birds when making chicken dishes; it's very little extra work and you'll have left overs for the week; that's part of our slow food, made fast philosophy. Two teaspoons of medium or hot garam masala. 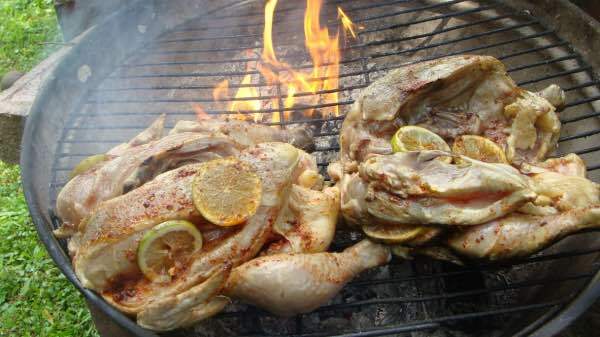 Rub the chicken pieces in the spice and grill them on a hot fire, turning frequently so they don't burn. Meantime, fry one whole chopped onion in oil, and then add the spices, and finally after a few minutes the lemon juice and vinegar. 1/2 cup of olive or canola oil; obviously the former is the preference. 5-10 cloves of chopped garlic. A portion of freshly chopped chili, green or red depending on how hot you like your peri peri chicken. 1/2 cup of freshly squeezed lemon juice, including the pulp but not the pips, and a little of the zest. 1/2 cup of grape vinegar. Peri peri chicken is finger licking good; add as much red hot pepper as you like. Anti inflammatory chili really should be in all our diets, even in small amounts if we don't like the heat. And now back to the fire; once the chicken pieces are sizzling and slightly charred, they don't need to be cooked through, toss them in the marinade, and place them either in two oven dishes, or your potje. Cover with the rest of the sauce. Cover with some sliced tomatoes and if you want add some veggies such as zucchini squash, and even some cooked chickpeas. Turn the oven up to high heat, say about 170 degrees and let your pieces simmer for at least half an hour. Don't scorch the flesh on the fire; it's associated with an increase in bowel cancer; just enough to give the chicken pieces some flavour from the coals. If you want more spice, and less heat, then grill some cumin and coriander seeds in a pan until they are smoking and giving off a wonderful aroma; grind them in a small herb blender and add to your birds before putting in the oven. What is cumin is a question you may be asking. Fast healthy dinner recipes is the logo of this site. More about an important subject; capsaicin may slow PSA doubling time. Take good care of hubby's prostate with peri peri chicken! A tomato a day and regular enjoyment of avocado should be part of every man's regimen; mushrooms too for the selenium. Retain those chicken bones and freeze them; the bouillon will enhance any soup.